The pigs that come to Hog Haven Farm have a variety of stories, some good, some bad. In the past month, we’ve taken in three pigs with health concerns; two pigs are morbidly obese, and one was morbidly underweight. We like to share our rescue stories with our followers and donors, and would like to introduce you to three of our 2017 rescues: Oscar, Phil, and Mr. Pig! Originally raised in Kansas, Oscar came from an incredibly loving family. They trained him to walk on a harness and lead, and perform tricks for snacks. 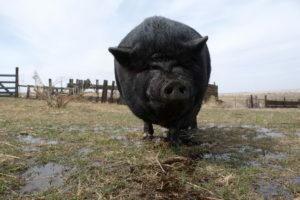 Oscar was just shy of two years old when he was surrendered to Hog Haven Farm; his is the tale of the negative relationship between pigs and dogs. Though his family loved him, he did not get on with their pet dog, and they made a difficult decision to surrender Oscar. The dangerous combination of pigs and dogs is the second most common reason pigs are surrendered or rehomed. There is an underlying predator vs prey instinct, and when that instinct kicks in, the pigs are the ones to suffer. Oscar has a happy ending, though! 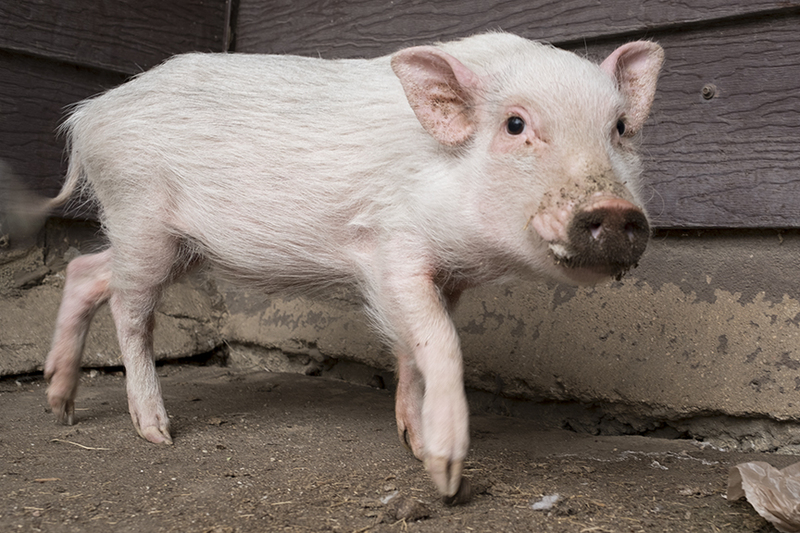 Because of the training he received from his first family, Oscar was introduced into our therapy pig program! Oscar loves to make residents at nursing homes/schools smile, and enjoys showing off his tricks. 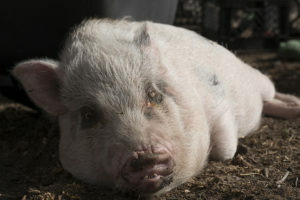 Additionally, Oscar formed a really strong bond with Annabelle, another surrendered pig that came to us the same week. We’ve only had Phil for a few weeks, and at time of surrender, he was severely underweight. There are many breeders across the country that offer bad information to keep pigs small–essentially, these directions are how to starve a pig. We know Phil’s family cared for him, but he was not being fed nearly enough, and was all bones, weighing about 20lbs, upon arrival. He will be two in June. We’ve been focused on Phil’s recovery–healthy weight gain–since his arrival. When any creature is malnourished, the process to health and weight gain must be slow and calculated. Phil is fed 4 meals a day, and we initially soaked his pellets in almond milk for healthy fat content. Additionally, Phil was given a booster for his immune system, and is on a vitamin regimen (calcium, Vitamin D, and a multi-vitamin) to help him become healthy. Phil has a big personality, and has been a pleasure to work with at the rescue! He loves snuggle time, though he has a bit of separation anxiety that we are trying to curb. We can’t wait to see what Phil looks like once he fills out! The newest rescue pig, Mr. Pig, is the sad story of morbid obesity. Approximately two years old, Mr. Pig was purchased to raise for meat. While potbellied pigs are domesticated in the United States, there are folks who purchase them to raise as a cheap source of meat. As you can see, Mr. Pig was raised on an unhealthy diet to increase his weight for slaughter, and weighs over 300lbs. Mr. Pig has a long road ahead of him–he must lose a significant amount of weight, which will take time. However, giving him a healthy, pig-friendly diet, as well as exercise, will help him trim up. We anticipate his weight loss will take a minimum of one year, but we are excited to give him a loving, happy, healthy home from here on out! Mr. Pig is currently living with residents Dug, Jimmy and Herschel, and right away these pigs welcomed him to their pen. We often think pigs can sense the needs of other pigs, and show empathy and compassion to pigs who need help.